Pursuing a master’s degree in data analytics has helped Ricky Esquivel on the job at USAA. (Dec. 11, 2017) -- Meet Ricky Esquivel. He’s using the knowledge he’s attained at UTSA in analytics to help mitigate risk in anti-money laundering. Working at USAA for 14 years, most recently as a decision science analyst, Esquivel wanted to gain a broader understanding of big data. 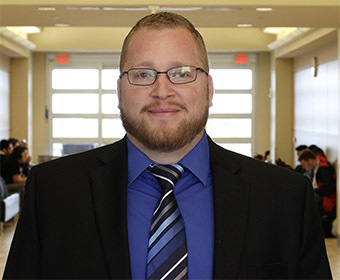 He began researching challenging academic programs and discovered the new Master of Science in Data Analytics at UTSA. The one-year degree program is producing highly skilled and educated data analysts who can transform big data into usable information for decision makers. Esquivel was part of the first cohort to enroll in the Data Analytics program in August 2016, when he began taking evening classes after work. Some of the challenging courses he studied for centered around big data technology and data analytic algorithms. He was immediately able to apply what he was learning at UTSA to his daily responsibilities at USAA. He is already making an impact at work using the knowledge he’s gained in his UTSA classes. Since enrolling at UTSA, he has been promoted to senior program project manager. Esquivel says staying with the same group of students throughout the program has also been beneficial. It’s helped him build relationships and network. Now, the cohort will be the first to cross the stage together at UTSA’s Fall Commencement. Learn more about the UTSA College of Business and its Department of Information Systems and Cyber Security. Learn more about the UTSA M.S. in Data Analytics program.